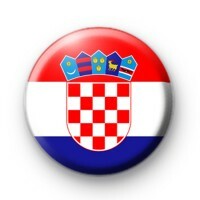 This 25mm (1inch) badge is of the Croatian National Flag Badge. The flag consists of three equal size, horizontal stripes in colours red, white and blue. In the middle is the coat of arms of Croatia. I hear Croatia is such a beautiful Eastern European country & that the city of Dubrovnik is the perfect place to holiday.